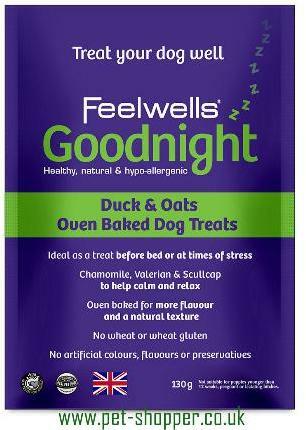 Feelwells Hypo-allergenic Goodnight Dog Treats with Chamomile,Valerian & skull cap for calming and relaxing your dog. These crunchy, biscuit treats have been oven baked for more flavour and a natural texture.Tasty & nutritious with the added benefit Chamomile, Valerian & Scullcap, ingredients known for their relaxing and calming properties. Ideal as a treat before bed or at times of stress. Healthy & natural, these biscuits are the ideal treat to feed your dog every day for a peaceful night.